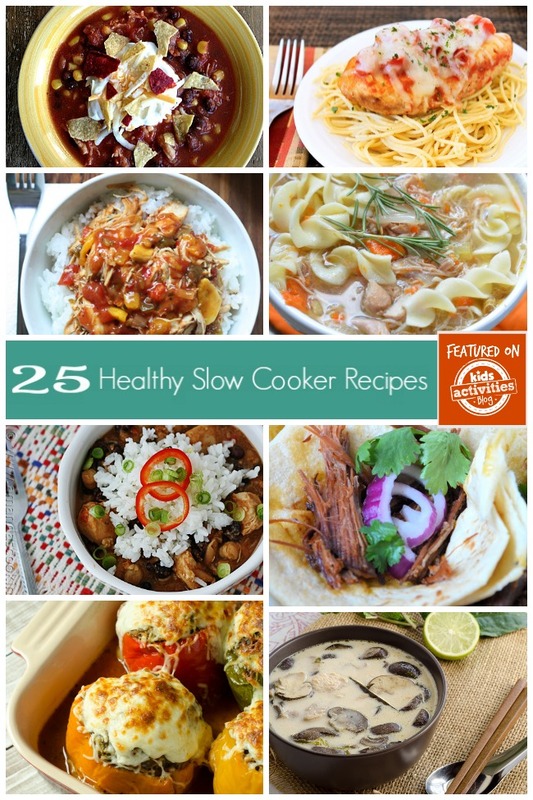 I love crockpot meals, and these 25 healthy slow cooker recipes are being added to my cooking arsenal. I have wanted to make healthier meals for my family, but I also love meals that can be prepared at the beginning of the day. With the meal taken care of in the morning, I am able to dedicate early evening time to homework, down time and after school activities. 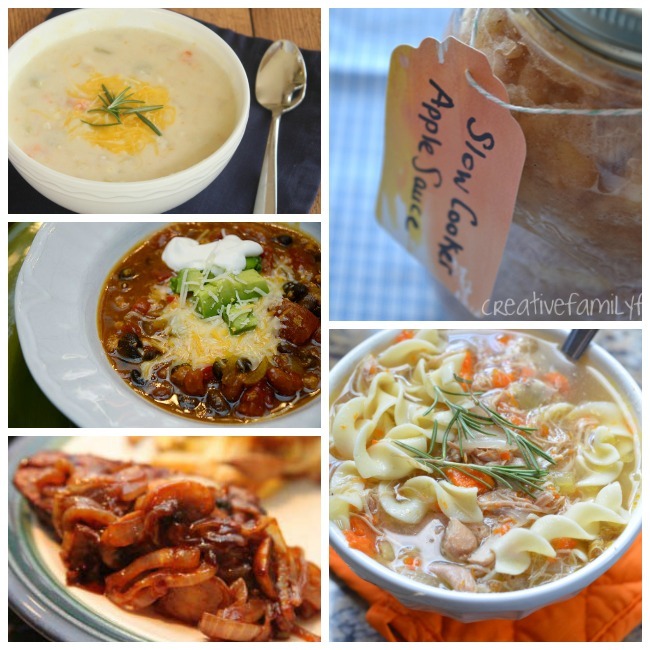 If you need more ideas for your slow cooker, please check out these great posts: 20 Fall Slow Cooker Recipes, 20+ Slow Cooker Recipes that Kids Will Love, Easiest Chicken Slow Cooker Recipes and 20 Family Friendly Beef Slow Cooker Recipes. One of our families personal easy favorites is my Slow Cooker BBQ Pulled Pork Sliders. 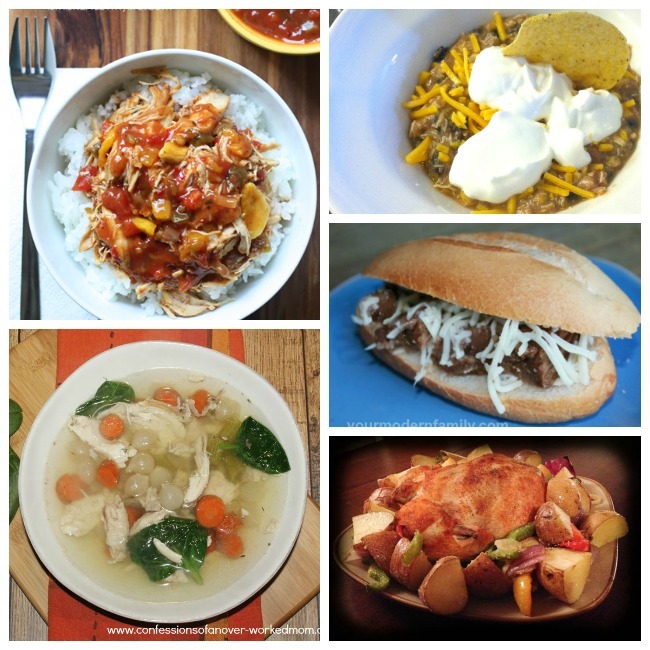 If you like to utilize your own slow cooker, I hope this post becomes a great resource for you. You are going to find some recipes hear that are packed with vegetables. Some will be low calorie if you are trying to limit your calorie intake. You’ll also find hearty elements that fill a belly in a healthier way. 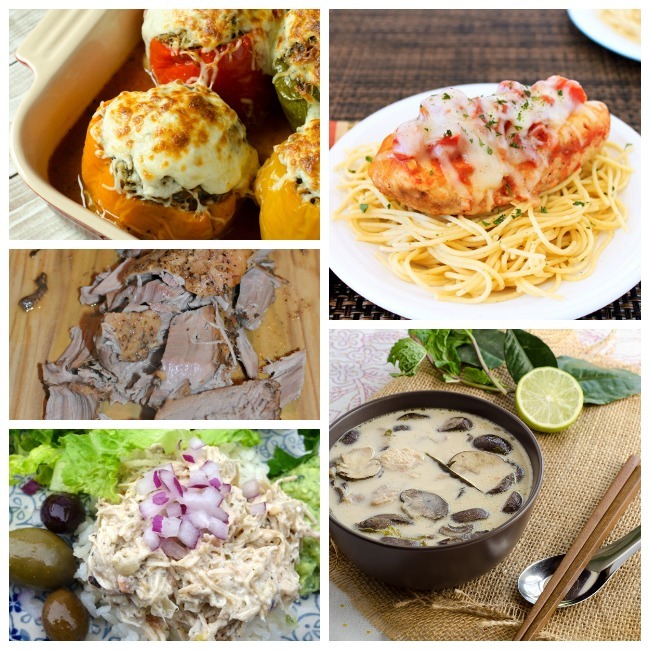 Each recipe has a variety of nutrients that will help you feel good about the food you are putting your body. Skinny Slow Cooker Ham & Potato Soup by Mom Endeavors – This soup is is packed full of all kinds of healthy vegetables. I love putting soups in the crockpot during the fall. Slow Cooker Applesauce by Creative Family Fun – This looks like a great snack to have around for the kids. This can be packed in lunches for school or served at home. Spicy Pumpkin Chili by Following in my Shoes – I love how this recipes combines fall flavors. Pumpkin is such a great and healthy addition to a traditional chili. This chili is also filled with vegetables, making it a hearty and healthy autumn meal. Slow Cooker Steak, Mushrooms and Onions by Feels Like Home Blog – Sometimes beef gets a bad rap, but it has so many great nutrients like iron, protein, Vitamin B12 and Zinc. At 327 calories per serving, this is definitely a safe meal for those who are cutting back. Chicken Noodle Soup by Mooshu Jenne – Chicken noodle soup is a taste of home, a comfort food and a natural remedy for colds. This slow cooker version looks delectable. Slow Cooker Mango Chicken by Is This Really My Life? – Are you ready for an easy family meal? With only 4 ingredients, you will be pleasantly surprised by both the mix of flavors as well as the ease of preparation. Crock Pot Fiesta Chicken with Salsa by Your Modern Family – This meal takes minutes to put together, but if you’re looking for that yummy Mexican flavor, this is it. Skip the cheese and sour cream to keep it really lite. Paleo Chicken Soup Recipe by Confessions of an Overworked Mom – Do we have any people here following the Paleo diet? This looks like the chicken soup recipe for you. I love the addition of thyme and rosemary to a chicken soup, and this looks fabulous. Low Calorie French Dip Sandwiches by Your Modern Family -My husband loves french dip, and this one looks tasty. This sandwich is less than 500 calories. Easy Whole Chicken in the Crock Pot by the Realistic Mama – Take a whole chicken and add some seasoning and vegetables in the crock pot – What’s easier than that? Serve with some roasted vegetables, and you have a great meal. Slow Cooker Fresh Tomato Sauce by I Eat Therefore I Cook – Sometimes people forget that sauces are a great way to get nutrients. With this homemade tomato sauce, you are getting all of the health benefits of tomatoes, garlic, carrots, onions, herbs and olive oil. Cilantro Lime Chicken by The House of Hendrix – I love the cilantro and lime combination. I bet this chicken would be great by itself, but I can also see adding it to a taco shell or tortilla with fresh salsa for extra flavorful nutrients. Healthier Tailgating Chili by Mess for Less – This sounds like a hearty recipe that is filled with vegetables, ground turkey, beans and all the great spices that makes a chili a chili. 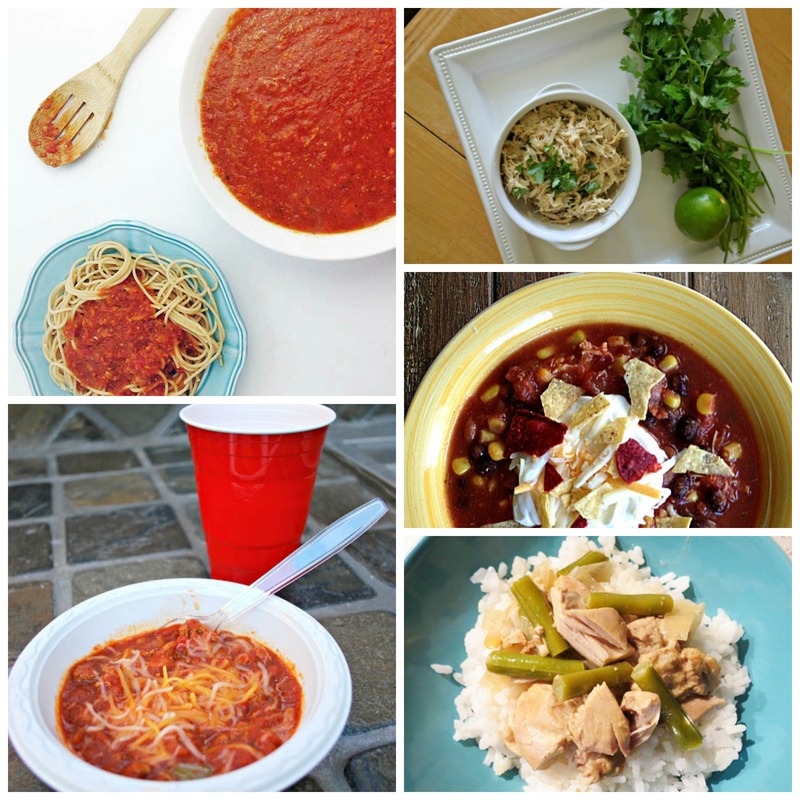 From Freezer to Crock Pot Chicken Taco Soup by The Chaos and the Clutter – Here’s a tasty looking slow cooker soup that is gluten free. Another great component of this dish is that it is a freezer meal, which can be very convenient for busy families. Family Friendly: Slow Cooker Chicken Curry by Childhood 101 – I love the warm flavors of curry. It looks like an easy preparation meal too, which is a big bonus for busy moms. Spicy Beef Brisket Carniatas by Mooshu Jenne – I love the flavors from south of the border. These spicy beef brisket carnitas look so yummy. Slow Cooker Moroccan Chicken by Beauty Through Imperfection – Are you looking to be transported to a different place? These Moroccan flavors sound amazing. Easy Lentil Soup by Playtivities – You’re going to love to see how this mom made this lentil soup appealing to kids. This is a very healthy soup for a cold fall day. 3 Bean Salsa Chicken by Amanda’s Cookin’ – This hearty southwestern meal will satisfy. It’s is packed full of healthy elements, providing nutrition and yet filling the belly. 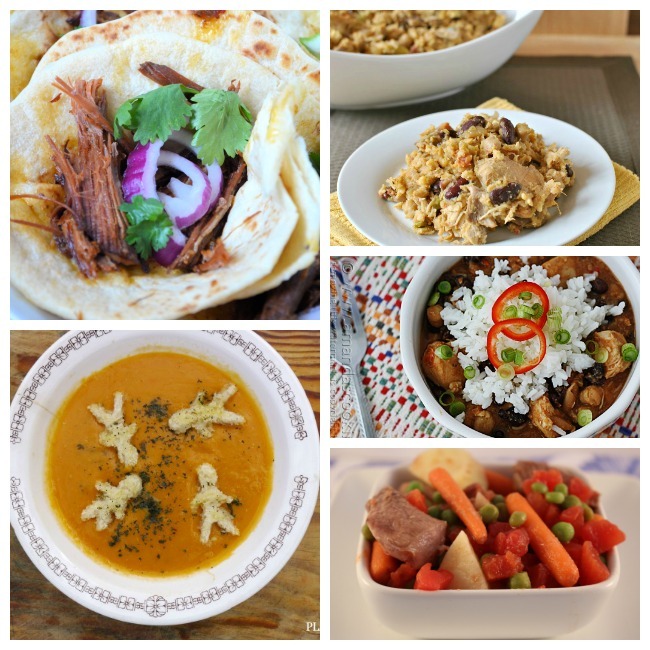 Easy Slow Cooker Beef Stew by Our Small Hours – Here’s another recipe packed full of vegetables. A beef stew is a comfort food and yet has a lot of healthy components. Paleo Italian Stuffed Peppers by Following in my Shoes – This is a unique dish with a fabulous presentation. For those practicing a Paleo diet, you will impress your family and guests with this stuffed pepper dish with an Italian flare. Slow Cooker Chicken Parmesan by Sweep Tight – Do you love Italian flavors? Pair this chicken parmesan with some whole grain pasta to up the nutritional value. This would be a very child friendly meal. Slow Cooker Balsamic Garlic & Rosemary Pork Tenderloin by Luv a Bargain – With three of my favorite flavors packed into it, this sounds like the winning combination for a pork tenderloin. Yes, please! Thai Coconut Chicken Soup (Thom Kha Gai) by Following in my Shoes – We love Thai food in my house, and Thom Kha Gai is a favorite. These anticipated flavors and the pictures from this post make my mouth water. If you are not familiar with Thai food (or even if you are), this soup is a must try. Greek Chicken Tacos by Farm Fresh Feasts – The avocado feta dip on this taco looks fabulous. You can eat it in a tortilla or served with rice. I would probably do some kalamata olives with my Greek taco.